Earthshine illuminates this waxing crescent moon in this photo taken by Vegastar Carpentier on Nov. 17, 2012 from Paris, France. Carpentier used a Canon EOS 1000D camera and a refractor 1000mm telescope to capture the image. 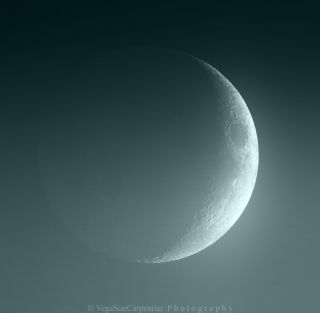 A waxing crescent moon is aglow with earthshine in this beautiful night sky photo. Photographer VegaStar Carpentier took this photo on Nov. 17 from Paris, France. Carpentier used a Canon EOS 1000D camera and a refractor 1000mm telescope to capture the image. When sunlight reflects off the Earth and shines onto the moon, the phenomenon is called "earthshine." A crescent moon is between a new moon and a half moon. The moon in this image is waxing at 16.7 percent of lunar illumination. Editor's note: If you have an amazing skywatching photo you'd like to share for a possible story or image gallery, send images, comments and location information to managing editor Tariq Malik at tmalik@space.com.